On March 5, the CPD Network joined United We Dream, the Women’s March, and a number of other groups to organize a mass march and act of civil disobedience in Washington, DC. It was the self-imposed deadline for a crisis that President Trump created six months ago when he ended the Deferred Action for Childhood Arrivals (DACA) program and left hundreds of thousands of young immigrants living in uncertainty – wondering if they will lose their jobs, have to dropout of school, be torn away from their families or uprooted from their home. 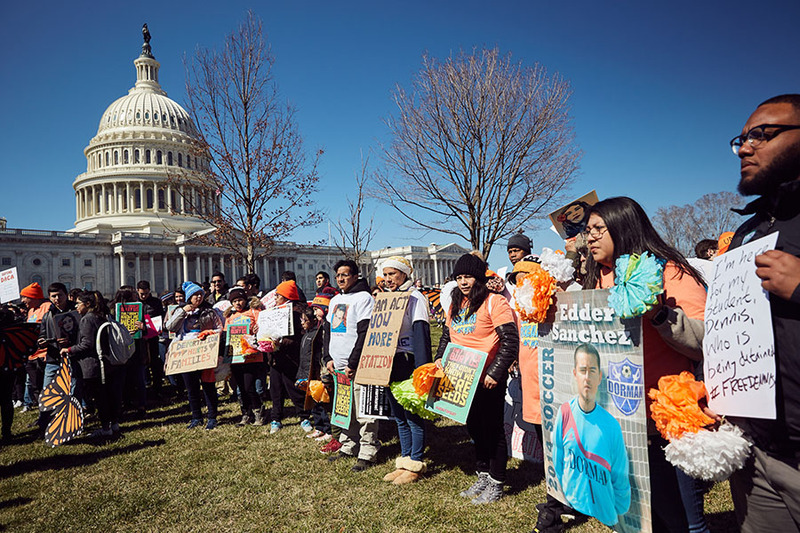 Trump gave Congress until March 5 to solve this crisis and then – along with Republican Congressional leaders – sabotaged any bipartisan effort to pass the Dream Act. Rallying behind a banner that read: “They tried to bury us, but they didn’t realize we were seeds,” a thousand immigrant youth and allies marched to the Capitol to denounce Trump’s political games and to demand that Congress take action to protect young immigrants – without harming their families or other members of the immigrant community – and reject Trump’s demands to fund a racist border wall and his mass deportation agenda. Nearly 100 people were arrested during acts of civil disobedience in the streets in front of the Capitol and in visits to offices of Members of Congress. The action made headlines in ABC News, NBC News, Univision, NPR, Associated Press, CNN, and Arizona Republic, among other local outlets. For real-time action, watch the event livestreams on BuzzFeed and Time. CPD affiliates traveled from all over the country to participate in the DC action, including NYCC, Make the Road Nevada, LUCHA, Action NC, Sunflower, and Delaware Alliance for Community Advancement. Immigrant youth and families were joined by faith leaders, healthcare activists, and other allies. Many other CPD affiliates organized powerful local actions around the country. See photos on CPD Action’s Facebook page.